The evolving video compression makes it possible to watch hundreds of channels nowadays since videos can be compressed small enough. And HEVC sets the milestone in the big step forward towards compression tech. Now comes the question: What is HEVC codec? How much do you know about it? 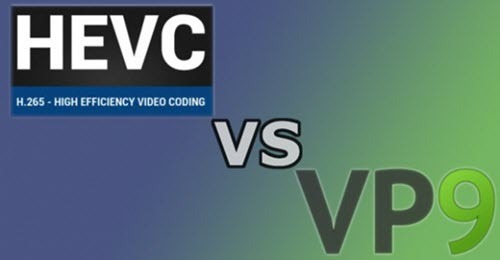 Can you differ HEVC/H.265 codec from H.264, VP9 or other video coding formats? How to play HEVC? If you want to dig further into HEVC codec, this post lines up to offer you everything about HEVC. HEVC is short for High Efficiency Video Coding, which is also known as H.265. The HEVC/H.265 substantially improves the data compression ratio for videos, thus saving a massive bandwidth and ensuring a 50% bit rate reduction at the same level of video quality. Besides, videos encoded with H.265 take up less space than H.264. Or you can say H.265/HEVC offers greatly improved video quality at the same bit rate compared with H.264. To customers, they can watch high-definition TV shows, 3D Blu Ray and even high-quality 4K/8K videos online smoothly. It's highly recommended to compress 4K/8K HEVC/H.265 videos to H.264, MPEG4, MP4, AVI, WMV, MOV, etc in 1080p/720p/320p with the aid of powerful HEVC/H.265 video converter so as to get a better playback on computers and portable devices with lower resolution display. H.264/MPEG-4 AVC, the predecessor of HEVC, is famous for compressing huge amount of information of a video for steaming over YouTube, Netflix, Vimeo, etc. Those videos from the video streaming services are generally in 1080p (2.1 megapixels) or 720p (0.9 megapixels). But for the 4k video with 8.3 megapixels, it seems to be impossible to store or transmit the UHD video if compressed with H.264. Due to the less efficiency in video compression with H.264, coding distortion situations are likely to happen in border areas. HEVC/H.265 codec manages to offer the same level of video quality but half the size of video compared to its successor H.264/MPEG-4 AVC, which means these 4K contents need only half the data to stream over YouTube. The size of code unit is determined by the regional information. Plus, the quality of video encoded by HEVC is substantially enhanced under the same bit rate. That That's way HEVC is widely used to compress video with 4K or even 8K resolution. Since HEVC/H.265 is the successor to H.264, there is bound to be a comparison between HEVC/H.265 and H.264. So how does HEVC or H.265 advantages over H.264? Still here, just scroll down for the answer. Approved date: The first version of H.264/AVC was standardized in 2003 while HEVC was formally ratified as a standard 10 years later in 2013. Size: H.265/HEVC reduces the file size by about 39-44% at the same quality compared to H.264. That means, If you download HEVC MKV movie in 4K with 2hr in length, you will get around around 1.25-1.5GB compared with the same movie with 3GB encoded by H264. Bit rate: With the use of HEVC/H.265 codec, bit rate savings are reported to be 50% or more compared to H.264, which is proven at the 2012 Mobile World Congress. Meanwhile, the H.264 reportedly showed almost 50% bit rate reduction compared to MPEG-2 Part 2. Availability: H.264 is available to deliver HD sources (1080p/720p) for broadcast and online. While better than H.264, X265, H.265/HEVC is likely to implement Ultra HD, 2k, 4k and even 8K for broadcast and online. Google's VP9 is tantamount to HEVC/H.265 as the UHD codec. HEVC is reported to deliver a 50% gain in compression efficiency over H.264 and VP8 standards while maintaining the same video quality. While Google's VP9 supporters make the same claim. Here you can see the clear difference between VP9 and H.265/HEVC. Bit rate: HEVC/H.265 provides a bit rate saves of over 43% compared to VP9 that is on par with H.264, according to some academic studies. But VP9 is a free codec, unencumbered by license fees, which is a strong motivation for advancing an alternative to HEVC. Quality: HEVC/H.265 offers superior quality to VP9. Study produced by Maxim P. Sharabayko showed that HEVC/H.265 provides about 31- 40% improvement compared to x264 while VP9 is only 18% better than x264. Browser compatibility: HEVC playback is supported in DivX while VP9 has the advantages unsurprisingly, with support in Google Chrome, Opera and Firefox. Both VP9 and HEVC play in VLC and 5KPlayer. So you want to watch the 4K HEVC encoded video on your UHD TV or share a 4K video on Facebook? Then you need to download HEVC/H.265 codec pack to fit the bill. This is because HEVC codec works as the software to decode or encode HEVC video, which helps to create and play 4K/8K videos on your computer or devices without any incompatibility issues. Below are 3 top HEVC/H.265 codec/player to meet your needs. x265 - An open-source video encoder for HEVC/H.265. It claims to offer the highest encoding speed and possible quality at any given bit rate. DivX - The first of its kind video software that enables users to create, stream and play videos. You can convert and play videos up to 4k in the formats like DivX, MKV, HEVC and MP4 without any problem. 5KPlayer - It is embedded with 370+ input and output codecs, including the breakthrough H.265/HEVC video codec, the top HEVC player doesn't need any external codec to play 4K/8K video files encoded with HEVC smoothly on both Windows PC (Windows 10) and Mac without degrading the video quality. VLC Player - This media player updated to the version 2.2.0 on Feb 27, 2015, merging the support for x265 to provide a robust support for HEVC/H.265 playback. For video buffs, what matters them most is to play back HEVC videos or share UHD videos to online video site with no issue. 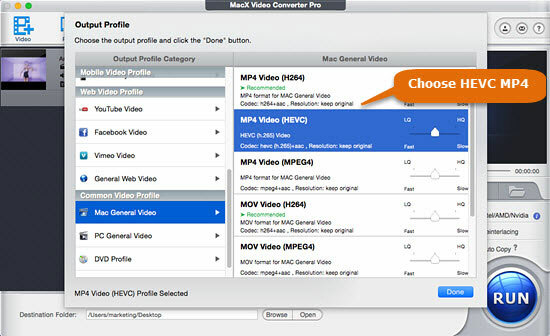 So here we highly recommend you to use MacX Video Converter Pro. By adding the support of H.265 codec, this HEVC/H.265 video converter works as a HEVC decoder that downsizes H.265/HEVC videos without damaging the quality while freeing up space and outputs the UHD videos in a supported format of your choice, say MP4, MOV, AVI, WMV, MKV, etc. Besides, it serves as a H.265 encoder that encodes common video files to high quality H265 video for better visual effects with 50% compression. Below is the guide on how to convert SD/HD videos (AVCHD, MKV, MTS, M2TS, MP4, AVI, MOD, WMV, MPEG4, H.264) to HEVC/H.265 video on Mac OS. Step 1: Free download HEVC video converter on Mac, install and run it. Hit the "+" button to load the video you want to convert. Or you can even download 4K video encoded with HEVC video from YouTube, Facebook, or other 300+ online sites by hitting the "YouTube" button on the top corner of the interface. Tips: this HEVC video converter also works on Windows, including Windows 10, you can free download the windows version here. Step 2: Go to the output profile -> PC general video -> HEVC video. You can also decode HEVC video to H.264 MP4, AVI, MOV, WMV, etc from the output profile. Step 3: Tab the button "OK" and hit "RUN" button to start encode video to H265 or convert H265 to H264 on your PC or Mac. HEVC is not as widely acceptable as H.264. So you may encounter problem playing HEVC video. No need to worry anymore. you can download the best free H.265/X265/HEVC players for 4K/8K Ultra HD videos. Learn how to convert H.265/HEVC to H.264 with best H.265 to H.264 video converters on Windows or Mac and then enjoy HEVC videos on more devices, computers, tvs, etc. HEVC to MP4 Converter asks for more on the computer hardware during transcoding. You can download the best tool recommended in the guide to convert HEVC to MP4 fast and easily. MacX Video Converter Pro is a smashing HEVC decoder with top quality and fast speed. This feature-rich video converter also can help you easily convert other HD or SD videos to all kinds of mobile devices like iPhone 6s/6s Plus, iPad Pro, iPad Mini 4, etc.